53% of marketers say they have “too much to do with too little time.” Marketers have to plan campaigns that knock competitors out of the park, create content that both readers and search engines love, and hit very specific ROIs. Google search operators help to ease the tension. Google search operators are special characters/commands that help to elevate your search capabilities beyond that of a regular search. Sometimes these are also called “advanced operators” and are useful for a myriad of tasks included SEO audits and content research. They are productivity boosters that make marketing easier for marketers. More importantly, they can give you a look into what your competitors are doing to help you come up with better ideas. In this blog, I’ll show you 12 Google advanced search operators to outplay your competition. Most marketers have one thing in common: They all want to get featured on high-traffic sites. By using Google search operators, you can find more competitor content. You will discover more sites that accept guest posts in your industry. You will save time you might have wasted looking for sites that will accept the topics you write about. You will locate the sites linking to your competitors that makes them rank well on Google. So how do you find these sites using search operators? The exact match and minus sign operators come in handy here. 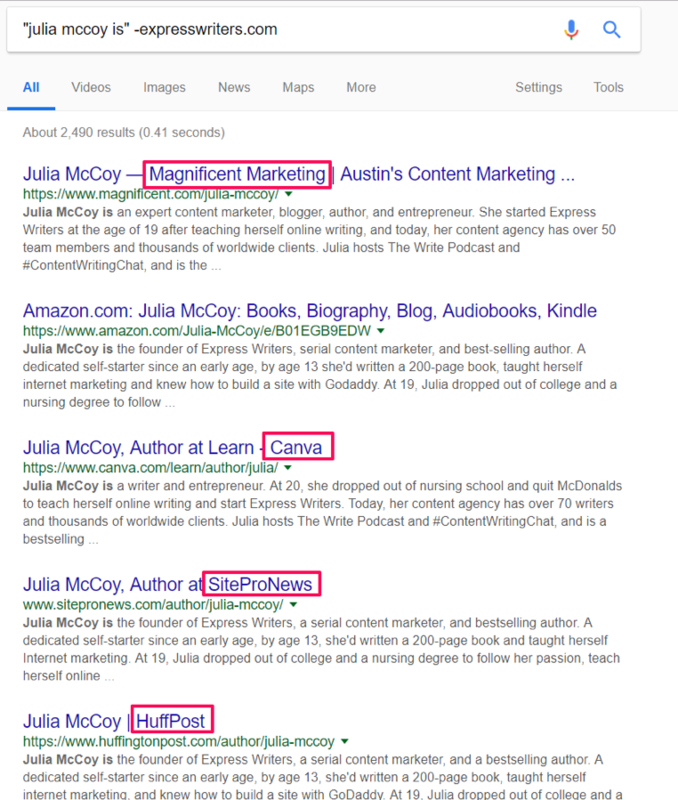 Search “‘name of my competitor’ is” -mycompetitorswebsite.com and Google will show where your competitors have author bios apart from the ones on their website. 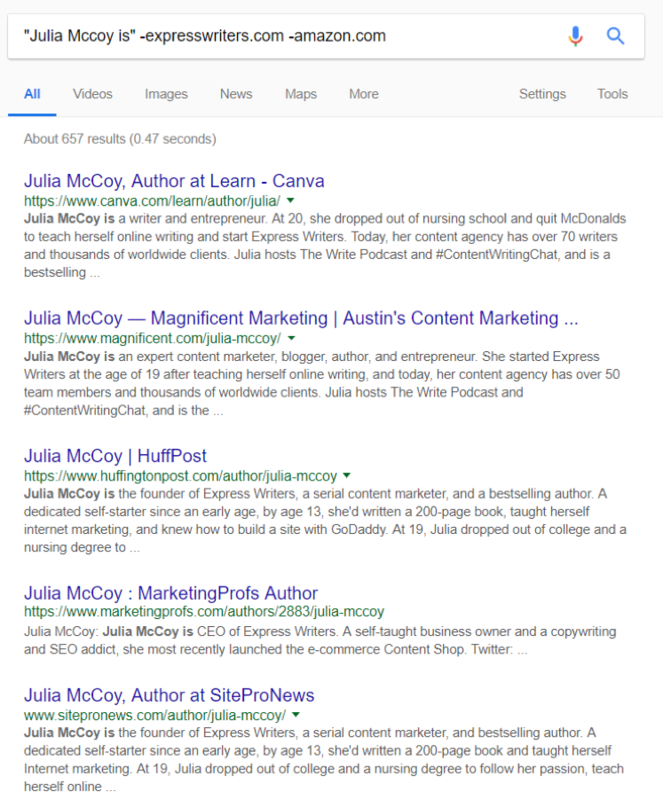 The results contain many of the sites Julia has been mentioned on that aren’t expresswriters.com, from Magnificent Marketing to Canva, SiteProNews, HuffPost and more. “Here’s a tip my intern shared with me. If you use a blog to generate leads, try looking up where the content marketer of the competing blog has written to find guest post opportunities. 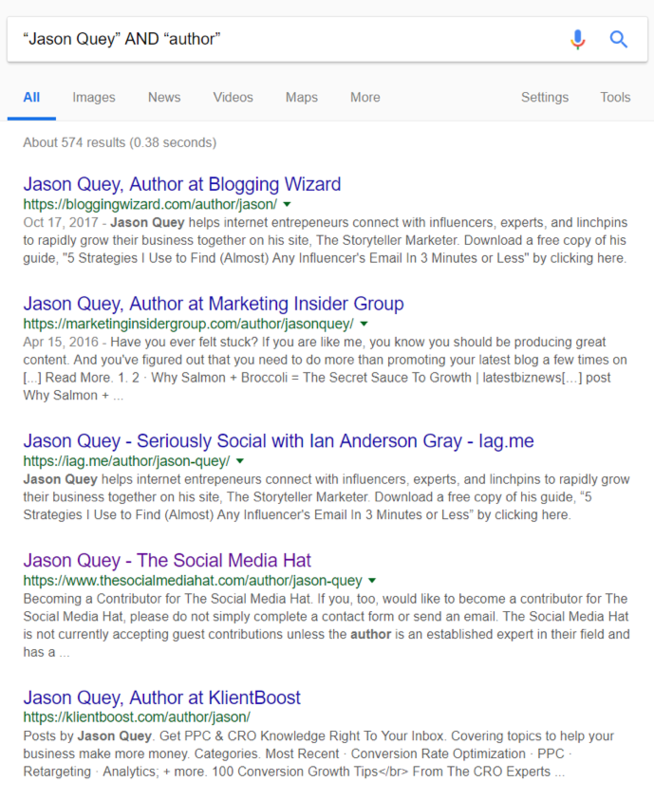 You can do this by looking up “FNAME LNAME” AND “author”; such as “Jason Quey” AND “author.” Now you have a list of target sites to go after. 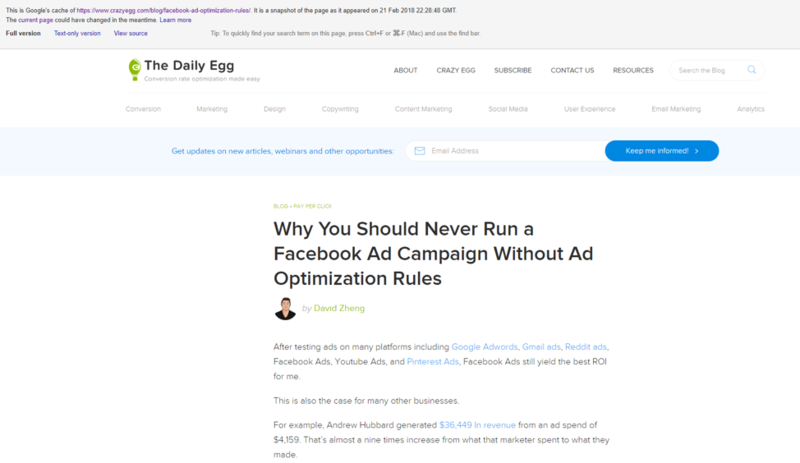 Also, if the competitor has more than one website or is featured on a site you’re not interested in, you can exclude those websites from your results as well using the “-” operator. You’ll notice the Amazon result is no longer in the picture. Now you have just the results you need—where Julia McCoy has been published. Next, you can open each of those links to see the quality of content required to get published on those sites. As companies keep reporting success with their content marketing efforts, writers are becoming more and more critical. 53% of B2B marketers say their content marketing approach has been moderately successful. In the same report, 21% described theirs as minimally successful; 20% say theirs has been very successful, and 4% of B2B marketers say theirs has been extremely successful. 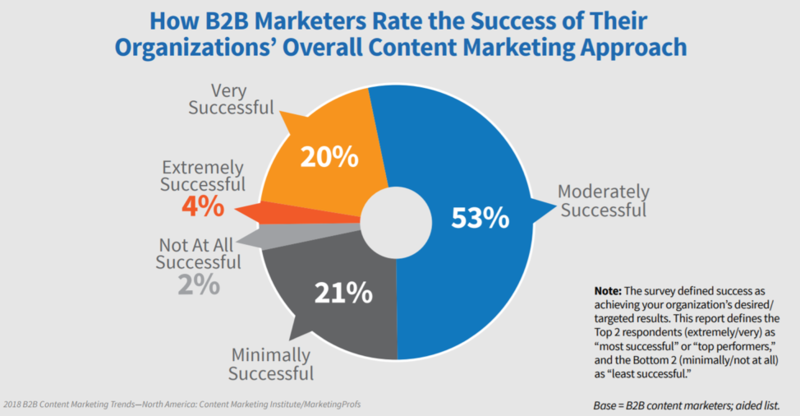 Only 2% of B2B marketers say their content marketing has not been successful at all. In total, 98% of respondents say their content marketing efforts have been successful to some degree. With the amount of relevance that content marketing has gained, you need good writers. And search operator commands can help you find them. 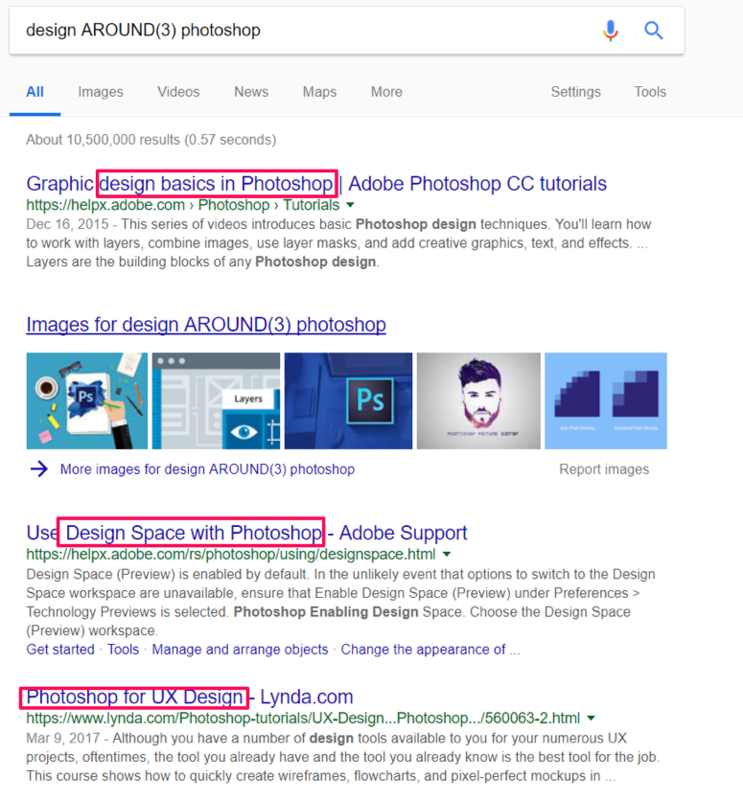 A simple technique is to do a site search on an industry publication for the specific topic you need a writer for and then check out who the writers are at that site. This way, you can outsmart your competition by hiring the best writers in your space. If I’m starting a blog about red wine and need a writer for it, I can go find one who writes for a health publication—since health is a close industry to my wine business. Let’s say I click through the first result there: Is red wine really good for your heart? I discover that she’s a medical writer. Her LinkedIn profile even says she’s a freelance medical writer. Voila, I’ve found what I’m looking for! She has written about red wine for a huge publication in the health industry. That reasonably validates her experience with my topic. But it may not be this simple all the time. The writer could have been anyone else but a freelance writer. 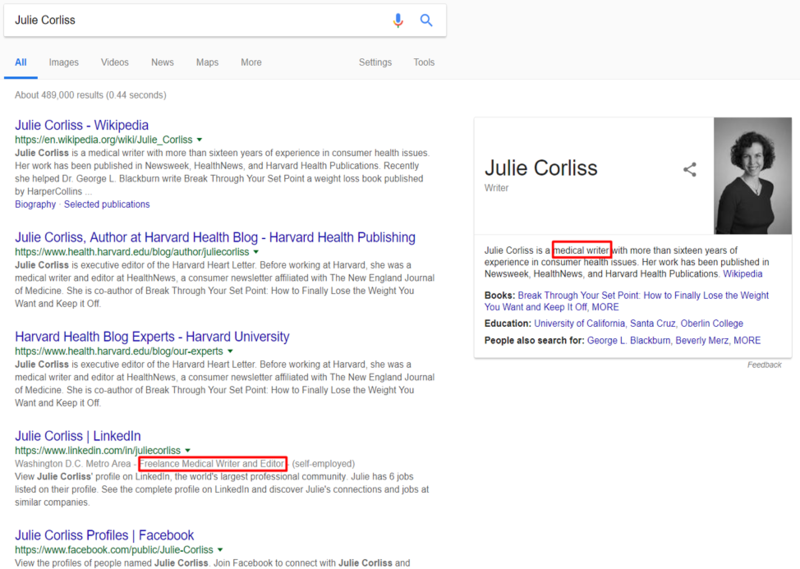 Julie, in my example, could have been a medical practitioner who only likes to share her expertise in health publications but has no interest in freelance writing. 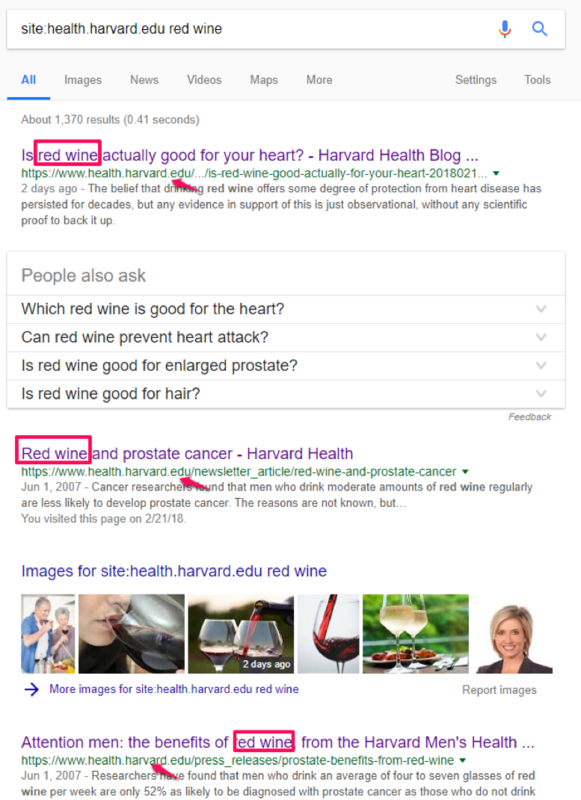 In that case, I would have to look at other results in the ‘site:health.harvard.edu “red wine”’results page. And I did but didn’t find any other writer. What to do next? I’ll do a site search on another health publication and keep trying until I find an expert writer. Should it be this stressful to find a writer? Well, if the average reader spends 37 seconds reading an article or blog post, you need great writers who can really keep prospects engaged with your content. And so, if writers are this crucial to any content marketing success, you want to do everything possible to find great ones. To find great writers that can outsmart your competition, your industry’s biggest publications are a great place to begin looking. If you find any writer on these publications or blogs, it’s because they’re good writers. Substandard writers are unlikely to have their material selected for those publications. What might you be missing when it comes to what your competitors are covering? For example, let’s say your competitor is Buzzsumo.com. You know they write a lot about content marketing, but you want to see other topics they write about without having to go digging through their site—which is going to be a whole lot of work. A combination of the site (site:), minus (-), and intitle (intitle:) operators can help you out here. Search site:buzzsumo.com -intitle:content marketing and you’ll see all other topics that buzzsumo.com write about apart from content marketing. You will find social media marketing, social media marketing world, email marketing, influencer marketing, and every other topic on the site, except content marketing. This way, you’re seeing all the other topics your competitor is writing about that are different from the ones you’re familiar with. Let’s say you have a competitor that creates a lot of great content. You admire their style and your target audience seems to like and share their content a lot. They probably even outrank you for many of the keywords you’re both competing for. When you want to create content on a specific topic, you may want to see what that competitor has written already on that topic. Three search command operators are useful here: the site, intitle, and exact match operators. 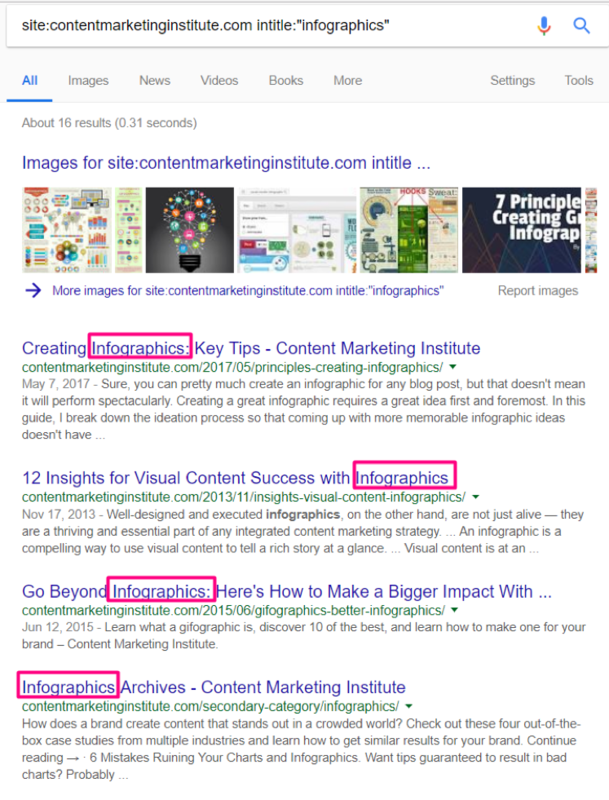 This way, you’re telling Google to find all the posts on the site that exactly have infographics in their title. 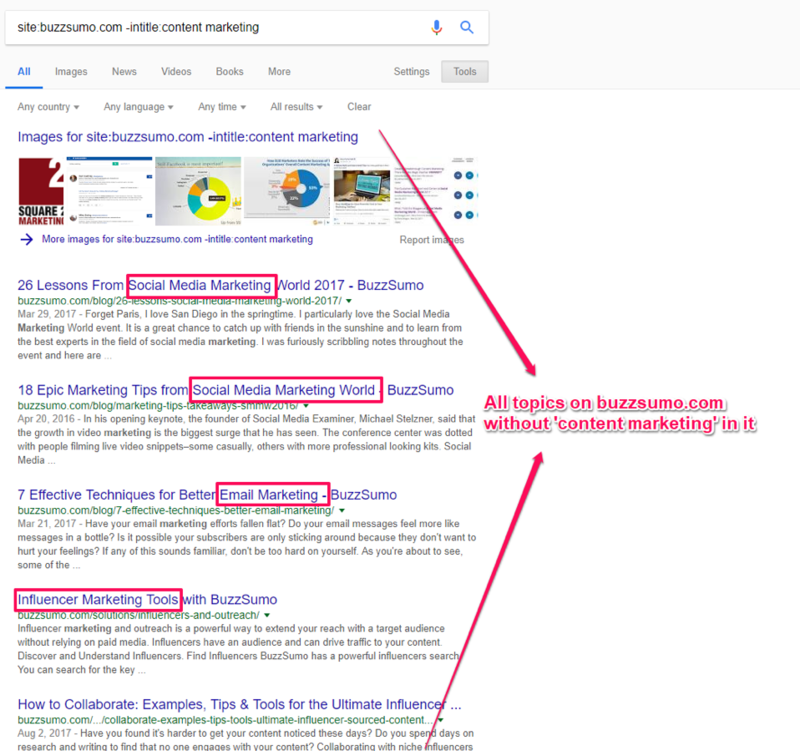 And more importantly, since Google always puts their best content first, with this search, you’ll find the best posts Content Marketing Institute has written on infographics and the different angles they’ve written each of them from. Maybe you’re building a new content marketing strategy, and you plan to write a few ebooks. But you’re not sure which topics are worth gating and which ones should be free for all. Gating your ebook will drive leads into your funnel. Leaving it ungated might not drive as many leads, but can drive more search traffic and shares. But you need to get it right. Not all topics are worth gating. And some are so worth gating you’d miss out on generating leads if you don’t gate them. A smart solution is to see how a successful competitor handles this situation. What are the ebook (PDF) topics that they’ve gated and which ones have they left free? Two search operators will be useful here: site:and filetype:operators. You can see the topics they’ve put in ungated PDFs. Your most successful competitors have some of the best marketers on their team, so if those marketers decide to ungate specific topics, you may want to do the same. Often, these marketers run rigorous tests to find out what interests their readers. So, imitating them in this area will no doubt prove to be a smart move. People search multiple keywords simultaneously sometimes to find comparisons or see how two or more things work together. Your competitors might have created content on those keywords. To see which sites rank for this keyword, of course, you can always use a keyword research tool. But going to Google is faster; just search SEO + content marketing. This way, you’ll find the different sites that have written about SEO + content marketing and what they’ve written so far. What if you could see the different list posts your competitors have published on a particular topic? Maybe you want to write a listicle post and want to ensure you’re not writing the same list number and topic a competitor has written before. Let’s say you want to write X best dinner recipes, but you don’t want to publish the same titles or list number your competitors have written before. In other words, if they’ve written about 17 best recipes, you want to ensure 17 is also not your number. The “..” operator can be handy here. It helps you find the listicle posts that have been published on specific topics. 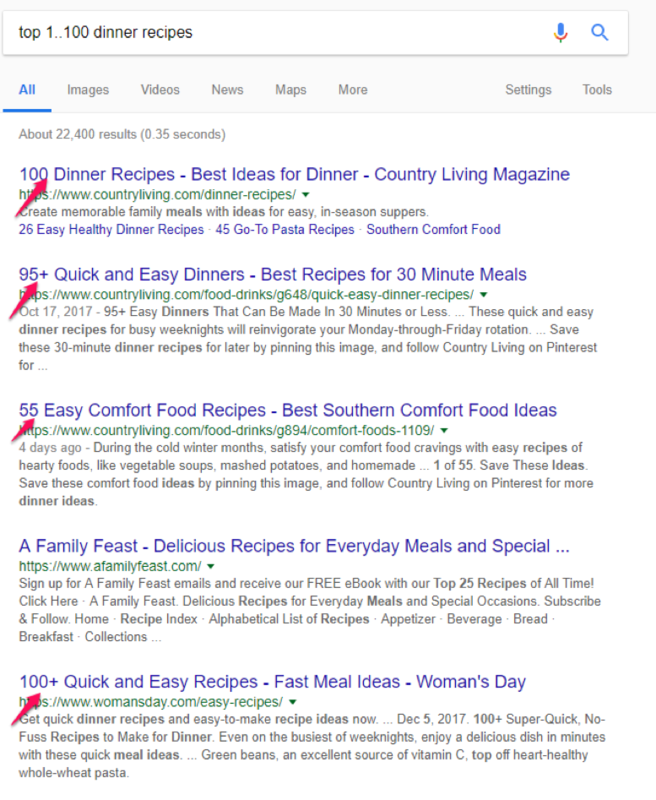 For instance, search“top 1..100 dinner recipes” , and you’ll find different list posts that other websites have created and ranked well for on this topic. You can see all the numbers your competitors have created on your topic. Now you can avoid creating the same, so you’ll stand out—both for Google and visitors. Sometimes you scroll through your social media timeline or results on Google and come across a post your competitor has written. But you’re busy, you can’t pause immediately to check it out or even find time to add it to your to-do list. You liked the post idea so much, and now you want to tweak it so you can create something awesome for your organization. But for some reason, you can’t remember exactly what you saw. However, you can remember two words. Here, you can use the wildcard operator represented by an asterisk (*). It tells Google to look for unknown words in your search query. Let’s say you’re trying to remember a post title Furniture Arrangement Ideas for Small Living Rooms, but only three words keep coming back to your mind—Furniture Arrangement Ideas. 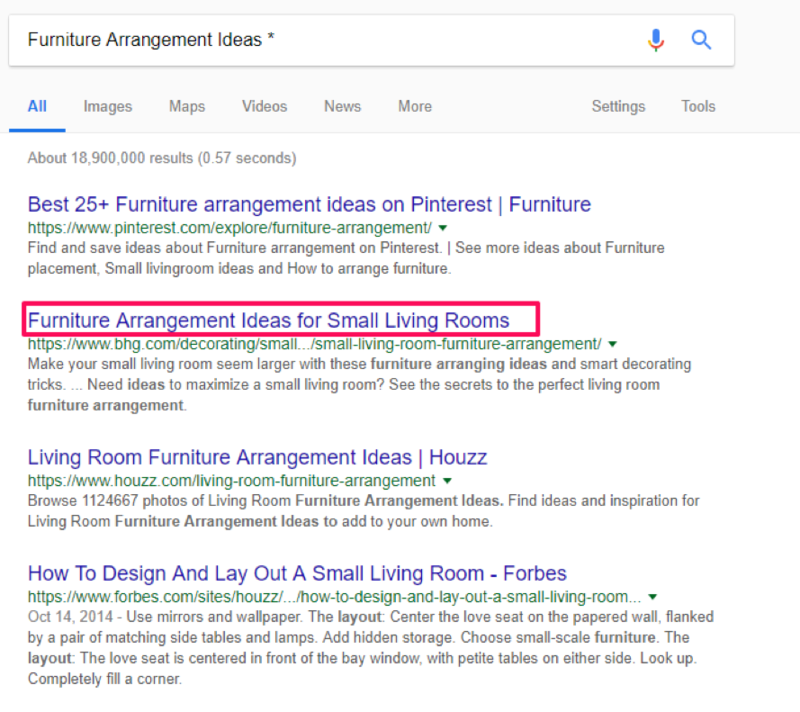 This way, Google shows you all posts with your keyword. With the “related:” operator, you can use one of your competitors to find out who else is competing with you. Simply include related: before your competitor’s domain, and you’ll get a page full of other competitors in your field. You could do this with a social listening tool. However, this is a quicker way to search. This way, Google shows you all the sites that are related to your business. And it is significantly faster than having to go through another platform. 10. Has a Competitor Said Anything About Your Brand? If your competitor has said something about you in the body of a page on their site—whether good or bad—you want to know what they said. Maybe they said something and didn’t alert you about it. Or maybe your brand mentioning tool missed it for whatever reason. In any case, when competitors say something about you, you need to know about it. 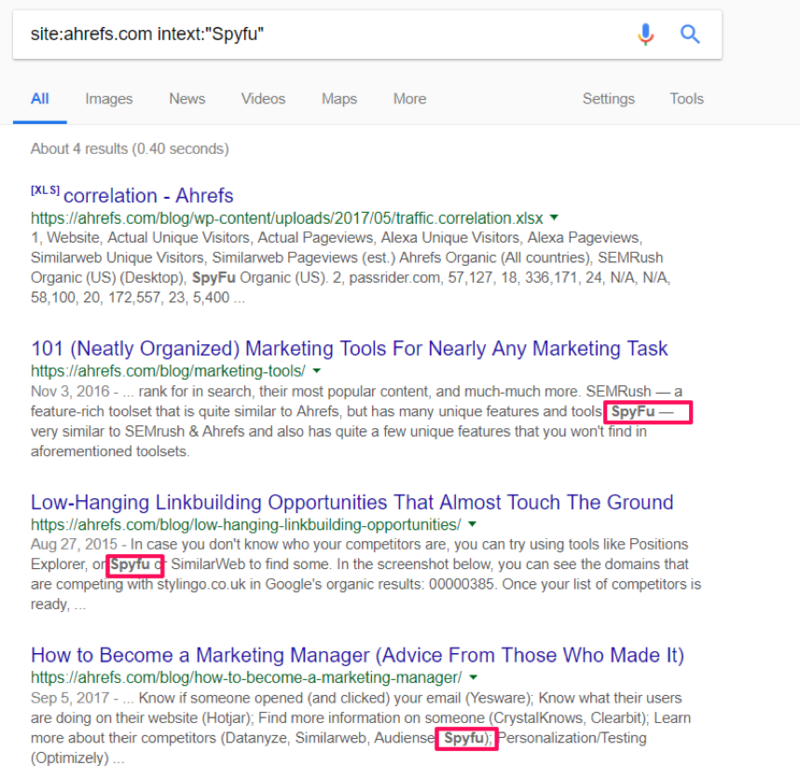 Suppose SpyFu wants to see if Ahrefs has mentioned them in the body of any post before. This way, Google shows SpyFu all the pages that mention SpyFu within their content. 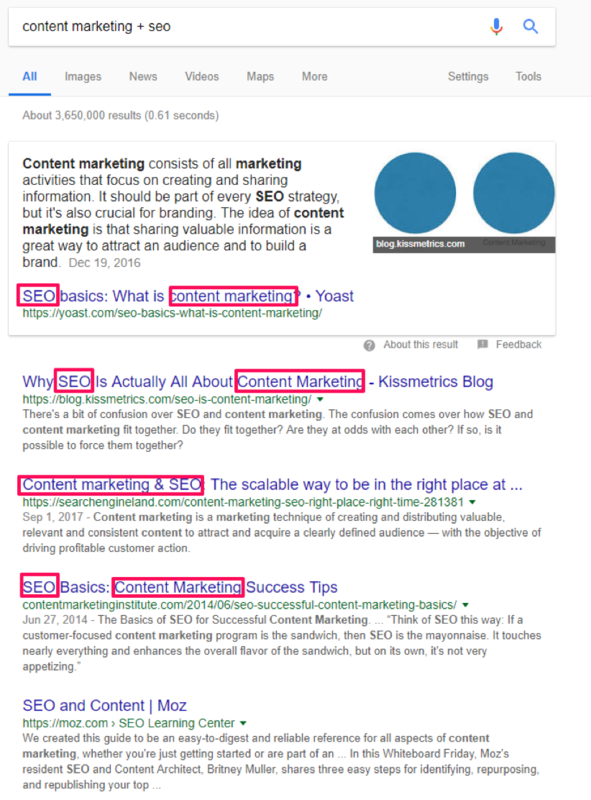 What if you could find all the long-tail keywords for a specific topic right on Google? You won’t have to log into any keyword tool. It’d be a powerful time-saver, right? 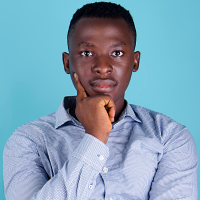 The AROUND(X) operator can help you find all the long-tail keywords that have been published on a particular topic. Take design AROUND(3) photoshop—with three being the maximum number of words between design and photoshop. This way, you can see all the long-tail keywords that your competitors have written around particular topics. However, it’s not always this accurate. 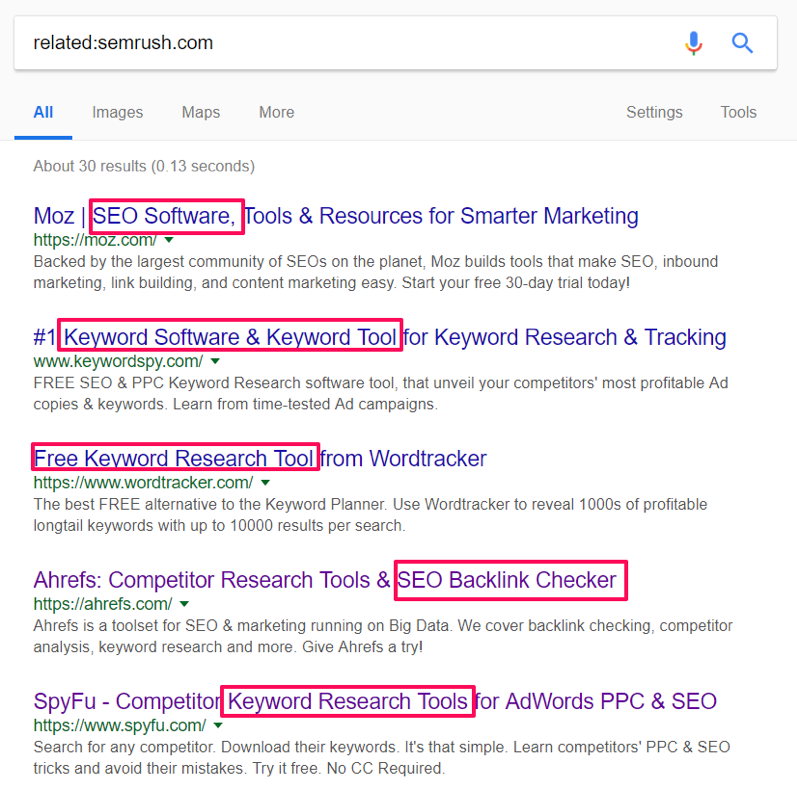 That you’ve put three in between two keywords doesn’t mean every single result you get for long-tail keywords will turn up that specific number. Ever come across a page on your competitor’s website that enlightens you or teaches you something important for your business? Maybe they announced a huge feature that gave you insights into a technique that could drive a lot of customers to you. Now you want to refer to it, and for some reason, the page has been taken down. If it has so much value, you want to find the page, right? This is where the “cache:” operator comes in handy. If you have the link of the page that was taken down, simply search cache:pagethatwastakendown.com and Google will bring it to you. In addition, if your competitor has earned some links via the page, you can create a similar page and reach out to the websites that have linked to them. Let them know they can replace the competitor’s backlink with yours. Nobody wants to link to a dead page, so they’ll mostly be happy to link to you. The tips I’ve shared here are in no way encouraging backstabbing your competitors or outright copying them. They’re to help you make smarter decisions while working in the same industry with your competitors. Use these handy search operator commands to locate valuable information quickly. You can look through your competitor’s ideas and tweak them to work for your company in a new or different way. You always want to differentiate to stand out from the crowd. But keeping up with what works best is also good practice. With these search commands, you are sure to implement a tool or strategy that’s totally different for your business. 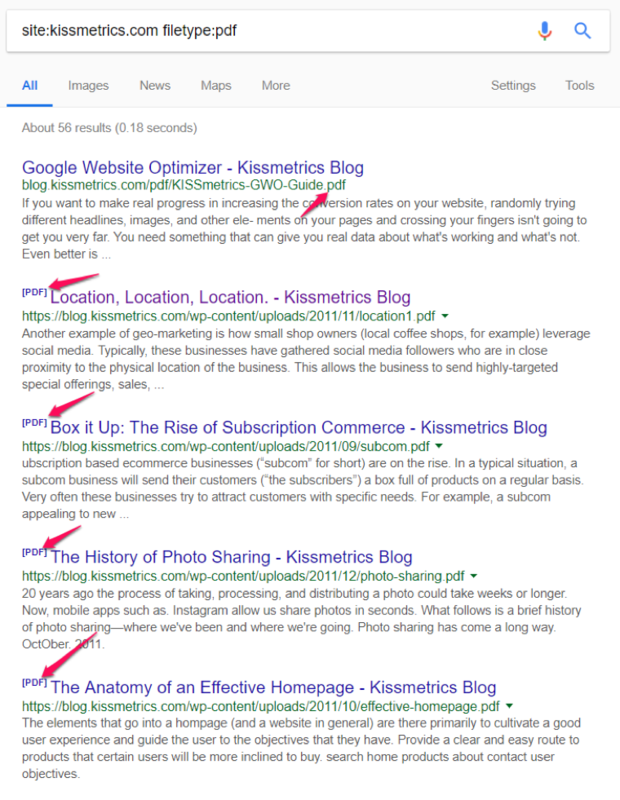 Do you use Google search operators in your marketing strategy? Tell me about how you do so in the comments. For more information on scaling this strategy with your company and more, check out my latest research.